Q： I opened one E2D3 template, then tried to open another one, resulting in error. [:en]A： Such phenomenon happens because the existing data and new data interfere on excel sheet. When you open a new template, please activate one cell using mouse, then if there are enough empty cells to the right and below directions, it should open with no problem. Q：When I use E2D3 graph share function, where is the data stored? Q： Can a user delete data shared using E2D3 (stored on E2D3 server)? Q： I want to modify existing E2D3 template. [:en]A： You need to modify source code. Please register and post as E2D3 contributor at GitHub, so our engineers can take a look. [:en]A：E2D3 functions are updated via data communication. When data communication environment is not good, there maybe some delays. Q: How can I move the E2D3 graph on the spreadsheet? Can I enlarge/shrink it? A: To move or enlarge/shrink the E2D3 graph object, you need to ‘select’ the object first. Place the mouse over the edge of the object. As the mouse becomes cross-shape, click the object. You will see the border of the edge thickens. Now, the object is selected. Drug the object, keeping the mouse cross-shape. Place the mouse to the white point at the corner of the object, or the one in the middle of the side of the object. As the mouse becomes double-ended arrow, drug the object keeping the mouse double-ended arrow. Can I edit the values of cells of the data area which E2D3 graph refers to? Does the E2D3 graph reflect the cell editing? [:en]Yes, you can. E2D3 graph changes automatically as you change the cell values of the data area. Can I delete a new row or column of the data area of E2D3 graph? Can I insert a row or column into the data area? [:en]Yes, you can for the most cases. 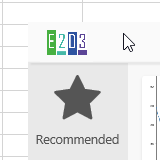 If you delete a new row or column, the E2D3 graph will be revised automatically. 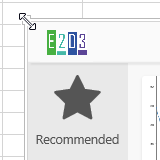 If you insert a new row or column, the E2D3 graph will be revised as well. 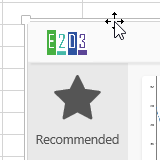 and click the ’Reset data area’ button on the top left of the E2D3 graph object. Then, the E2D3 graph will be revised according to the newly defined data area. How can I report the issue or bug, or something to change on e2d3? then please let us know by making “issue”. please write the issue with your OS, version, execel version. If you cannot use GitHub, please send email or message from our website or SNS. Email: info at e2d3.org (返信にはとても時間がかかります)[:en]Please contact us.